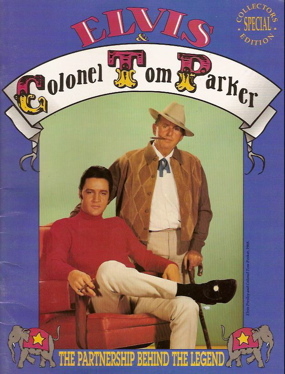 Those comments were not composed by a member of Colonel Parker’s PR team, but rather by Jack Soden, CEO of Elvis Presley Enterprises (EPE), in his foreword to a 1994 publication, Elvis and Colonel Tom Parker: The Partnership Behind the Legend. The 32-page tribute magazine was published by EPE and sold in retail stores at Graceland and the Las Vegas Hilton. The publication paid tribute to Parker’s handling of Presley’s career from arranging the first RCA deal in 1955 through organizing the successful concert tours in the seventies. The EPE publication and its praise of the Colonel was remarkable, considering that a decade earlier the Presley estate had sued Parker after a Memphis probate judge declared him guilty of mismanaging Elvis’s career and defrauding the star and his estate out of millions of dollars. Vilified by the press and Elvis fans in the 1980s, Colonel Parker was forced to completely severe his legal relationship with the Presley estate that he had been so instrumental in building. Yet, by 1994 he had been welcomed back with open arms by Elvis Presley Enterprises. The Partnership Behind the Legend publication was only a part of a year-long EPE tribute to Colonel Parker in 1994-95. 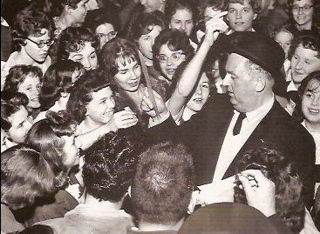 How did Colonel Tom Parker’s amazing comeback into the world of Elvis Presley come about? It can’t be traced back to one event. His resurrection can only be understood in the context of his humiliating fall from grace. It all started innocently enough in March of 1977, when Elvis’s new will named his father Vernon as the sole executor and trustee of his estate. According to the will, when Vernon died, all assets of Elvis’s estate would go into a trust for his daughter, Lisa Marie. 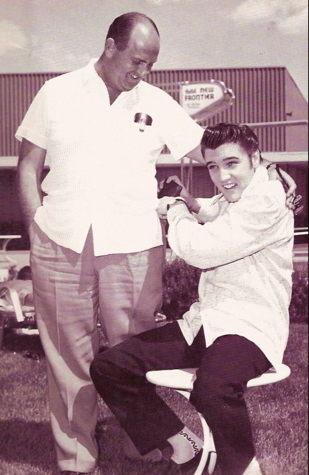 When Elvis died a few months later, Vernon signed an agreement with the Colonel to continue managing the estate’s income based on Parker’s previous contracts with Elvis. Vernon’s decision to keep Parker on board started a domino effect that led to the former manager’s public disgrace. Alanna Nash outlined Parker’s fall in her 2003 book, The Colonel. 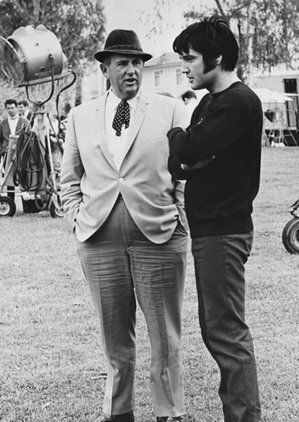 When Vernon died on June 26, 1979, his will named three co-executors to manage the Presley estate. They were Priscilla Presley, Elvis’s accountant Joe Hanks, and the National Bank of Commerce in Memphis. Three days after Vernon’s death, the co-executors asked Colonel Parker to carry on his management of the estate as he had under Vernon. All of the estate’s income would be forwarded to the Colonel, who would deduct his commission and send the rest to the estate. Colonel Parker had always kept his agreements with Elvis private, and so when details of the 50-50 contract were revealed, public sentiment against Parker turned nasty. The perception grew that the manager had always taken 50 percent of all of Presley’s income, which was far from true. Still, it was clear that the Colonel had “overreached” by progressively taking higher commissions during the last 10 years of his client’s life. 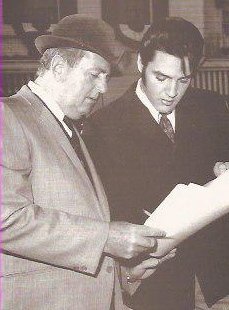 The first Presley-Parker contract containing the 50 percent figure was signed by both men on January 2, 1967. By that agreement, the Colonel received 25 percent commission on Elvis’s movie salaries and guaranteed RCA royalties, but the manager’s share jumped up to 50 percent on side deals and any income beyond basic payments in the film and record contracts. A new management contract in March 1973 gave the Colonel 50 percent of Elvis’s total income from recordings, not just from side deals. Then, when Parker set up Boxcar Enterprises in 1974 to consolidate the licensing of Elvis’s image on merchandise, the Colonel took 50 percent of that income. Finally, there was the 1976 contact calling for the 50-50 split on live appearances. Complying with the judge’s directive, the estate sued the Colonel in June 1982. The suit asked that Parker’s right to any contract with Elvis’s estate be forfeited. A settlement was reached in November, with the estate essentially buying the Colonel out for $2 million. The final agreement was signed in June 1983. After 28 years association with Elvis Presley, Parker’s ties with the entertainer had finally been severed completely. The Colonel was out of the picture. So how did he get back in the picture? The first seed of the Colonel’s return to the Presley fold was sown even before the estate’s lawsuit against him had been settled. And it was sown by Parker himself. Nash says that in June 1982, just a couple of weeks after Graceland had been opened to the public, EPE’s Jack Soden received an unexpected phone call from the Colonel. “You’ve got a big challenge ahead,” Parker told Soden. “Call me anytime. This battle isn’t between you and me.” The gesture may have softened some attitudes at EPE toward the Colonel. Colonel Parker eventually sold the estimated 35 tons of material to EPE for $2 million. It was a bargain price, considering the lot included Elvis’s 1957 gold lamé suit, perhaps the most iconic rock outfit in history. Today, it alone is probably worth more than the original $2 million price tag for the Colonel’s complete collection. Even if acquiring Parker’s Elvis stash was a factor in welcoming the Colonel back into the EPE fold, it surely would never have happened without the full support of Priscilla Presley. During her long relationship with Elvis, she obviously developed a much more positive attitude toward the Colonel than did many others in her husband’s inner circle. Remember, Priscilla was one of the co-executors who wanted Parker to continue managing the estate after Vernon’s death. In a video showed at an EPE banquet commemorating Elvis’s 53rd birthday in 1988, Priscilla and Lisa Marie gave a “special hello to an old friend of ours” and praised the Elvis-Colonel partnership as one that would never be matched “in the history of show business.” And when Barron Hilton threw a Las Vegas bash for the Colonel’s 85th birthday in June 1994, both Priscilla and Jack Soden came to honor their aging friend. "Although Elvis Presley Enterprises forgave Colonel Parker for his errors in judgment nearly 25 years ago, clearly most Elvis fans still have not been able to do so."